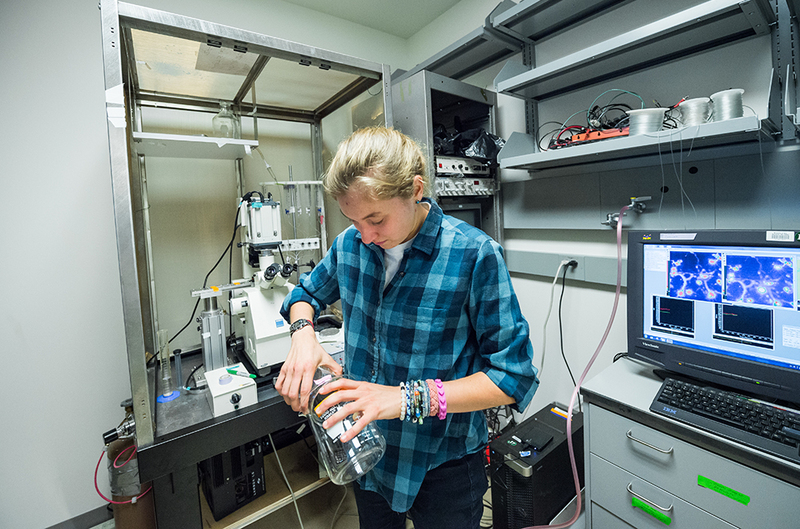 Above: Jillian Belgrad ’17 conducts research on Gulf War Illness at the National Institutes of Health. At the National Institutes of Health (NIH) in Bethesda, Md., Colgate alumni are on the front lines of scientific efforts to combat infectious and chronic diseases ranging from HIV to cancer to Alzheimer’s. 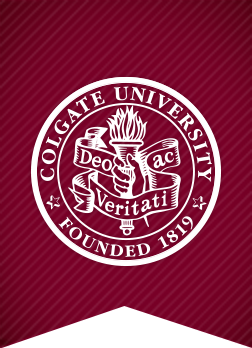 Several of these alumni started working in the same labs as students participating in Colgate’s NIH Study Group, which was formed in 1992 and is the only one of its kind in the country. 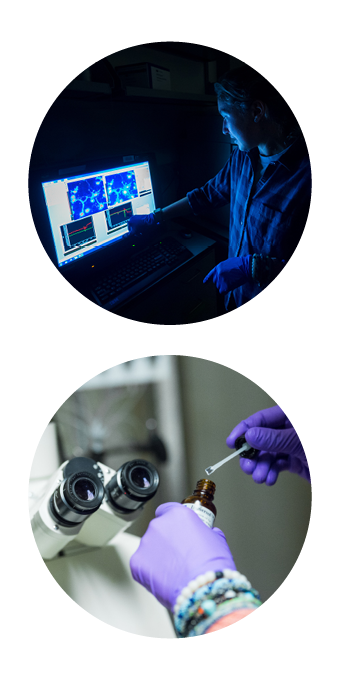 The program affords select students the opportunity to spend an entire semester at the nation’s leading health care research facility, often working side by side with scientists on the cusp of major discoveries. Students interested in medical or health care careers endure a rigorous selection process. Only rising seniors majoring in neuroscience, biology, molecular biology, biochemistry, or chemistry may apply to participate in the program. 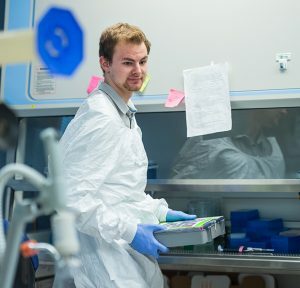 Students interested in the group are often mentored by professors in those departments, and they must have a solid academic record to ensure they are prepared for the challenges that await at the NIH. 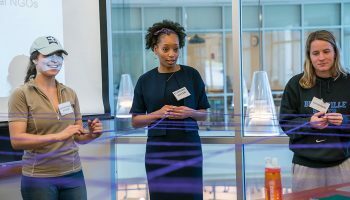 Now, step into the labs to visit with students in Colgate’s 25th NIH study group and two alumni post-baccalaureate researchers. Erin Huiting spends her days, and sometimes nights, working to find a cure for HIV. For traditional diseases, a cure would simply involve eliminating the pathogen, but the complication with HIV is how the virus infects immune cells and remains inactive, often persisting without a sign until a patient is taken off of drug therapy, Huiting explains. Now that one of the therapies developed by Huiting’s team has entered stage-one human clinical trials, she is helping to develop the scientific backing for “analytical treatment interruption.” When patients with HIV are going to take part in a clinical trial, they need to be taken off of their traditional drug regimens. Huiting’s research is focused on proving that a brief stint away from their daily treatment will be safe for the patients involved. 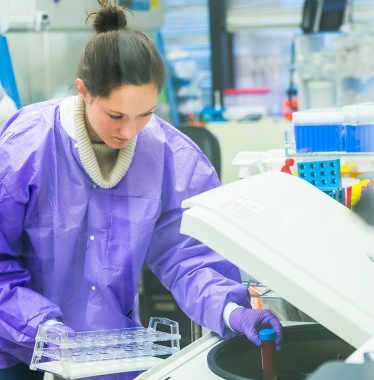 Once approved, participating patients in the clinical trial overseen by Huiting’s team will receive an injection of an HIV-specific immune antibody to try to enhance the immune system’s natural response to the virus. Post-baccalaureate fellows at the NIH work for one to two years, depending on the lab, and they use that time to hone their analytical skills while preparing for medical or graduate school, which Huiting plans to attend this year. Jillian Belgrad is trying to piece together a puzzle that she hopes will reveal an effective treatment for Gulf War Illness, a group of cognitive and motor disorders affecting some military veterans who served in Iraq. “The method I use is calcium imaging,” says Belgrad as she treats a series of rat brain cells with a dye called Fura-2. By examining those cells under a high-powered microscope, Belgrad can calculate the level of calcium in the cell — an element crucial for cognitive function in the brain — to help determine how specific chemicals may be altering brain function. For Belgrad, who is a post-baccalaureate fellow at the NIH, working with brain cells and analyzing the responses to various clinical treatment experiments is like having a conversation. When Belgrad participated in Colgate’s study group in 2016, she worked in the same lab as renowned researcher R. Douglas Fields. She loved working in a lab where everyone was asking questions and trying to think of new ways to approach difficult questions about the brain. Once her fellowship concludes, Belgrad will work toward an MD-PhD to continue her love of science and medicine. In the meantime, she’s enjoying working in a place that brings together researchers from so many different fields of science. Understanding how the brain is affected by high blood pressure is the focus of the neuroscience lab where Chris Higham worked during his study group experience. “We’re investigating how brain disorders might be caused by hypertension,” he explains. Dementia and learning disabilities, but also disorders like depression and anxiety could be connected to hypertension. 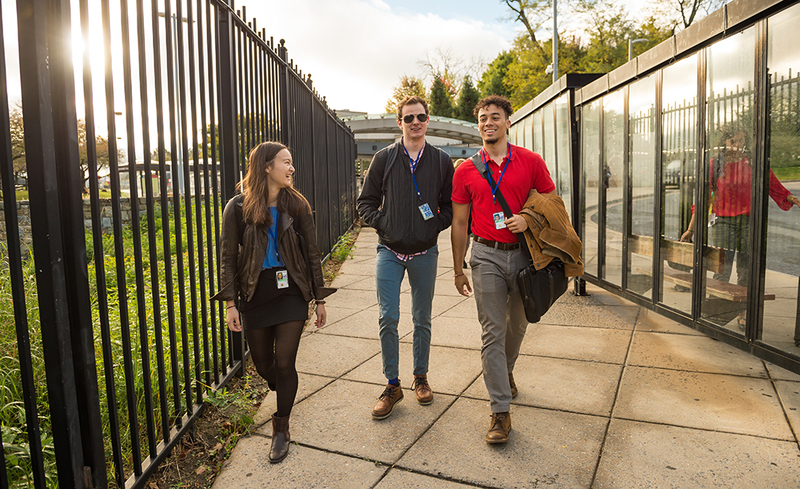 From left, Nicole Lue ’18, AJ Ward ’18, and Kasey Halsey ’18 walk to their labs on the campus of the NIH after a short commute on the Metro. For Nicole Lue, hearing researchers at the NIH discussing a “bench-to-bedside” approach to research gave added weight to her work studying how specific proteins in the brain relate to Alzheimer’s disease. 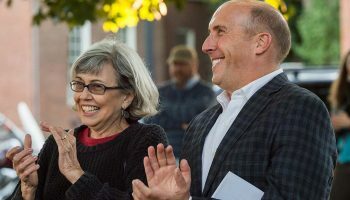 Part of the appeal of the NIH group — which Lue says attracted her to Colgate when she was looking at colleges — is that participants are actually part of the team developing real treatments. Even though Lue and the other students are immersed in their lab work, they still find time to get away. Study group members live in an apartment complex and take the metro in to work, often solving the Washington Post crossword puzzle together. A.J. 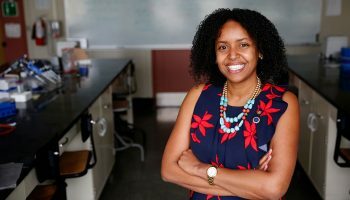 Ward ’18 works on HIV research. Like Erin Huiting ’17, AJ Ward’s lab is focused on HIV treatment, but his work takes a different approach to the virus. He studies CD8 T Cell response to HIV, specifically in people who have lived for more than 20 years with the virus but without signs of deteriorating health. “Their immune system is able to control the infection,” he says. “So, we’re looking at the phenotypes of the immune systems of those people and comparing those to people who get sick and progress normally. We’re seeing all sorts of differences,” Ward says. The hope is that they’ll eventually be able to use that information to create a prophylactic vaccine. As an undergraduate at Colgate, Ward read a few papers about flow cytometry. After just a few weeks as a member of the university’s NIH study group, he uses the lab technique on a regular basis. Like other students on the study group, Ward attends Colgate classes twice a week after working in the lab. 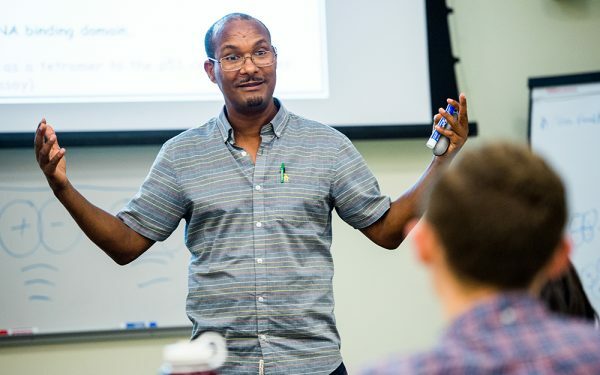 Each class is taught by Professor Engda Hagos; one is focused on cancer biology and treatment, while the other is a journal course in which students share the work they are doing in their labs.